Do you need help with Debt Management? Debt management is available to those individuals feeling trapped and overwhelmed by large amounts of credit card debt. You’re not alone if you need debt management – it doesn’t just happen to low- and middle-income people. You would be surprised at the number of people earning $100,000 a year or more who find themselves in trouble with unsecured debt. 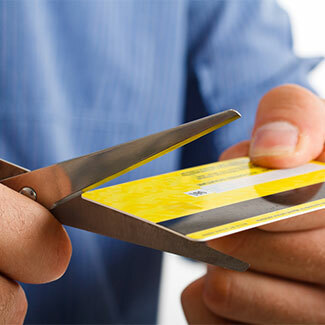 Despite the federal legislation of 2005 that put severe restrictions on individuals who declare bankruptcy, this is still one way to free yourself of the burden of credit card debt. However, this also have severe ramifications that can haunt you for up to a decade. Trident Debt Solutions can offer you a better way out by negotiating your debt down to a manageable level and arranging a payment program that can get you debt-free in two years or less. This is still something that should be avoided if possible, however. If you have $30,000 or more in credit card debt, an experienced attorney at Trident Debt Solutions can provide you with a better alternative. With so many debt services being offered today, why choose Trident? One reason is experience. Another reason is our dedication to providing a realistic and fair solution to every client we accept. As long as you have the $30K minimum debt required, we can help you get out of debt faster than you thought possible – and save you money both on your outstanding balance and service fees. Fee Structure: The average credit card debt relief company has a fee structure that is based on the client’s total outstanding balance. This fee – which can range from 15-21% – is the same regardless of how much or how little they save you. There is no incentive to negotiate the debt down to the lowest possible level. At Trident, our fee is based on 25-30% of what we save for you. That looks like it would be higher, but it’s not. Here’s an example of how you would fare under both fee structures: suppose your total debt is $50,000. 20% of that is $10,000. With the typical debt services company, they’ll get this fee whether they negotiate your debt down to $45,000 or $25,000. An experienced lawyer at Trident can negotiate that same debt down to 60%, or even 50% of what you owe. In our example, let us suppose we can get your $50,000 debt reduced to $30,000. That means you’ve saved $20,000. If our fee is 30%, that would come to $6000 – three-fifths of what the other company would charge, with better results for you. A Licensed Attorney with Experience: With 3000 bankruptcy cases under his belt, Trident founder and CEO Stephen Craig has the debt management experience required to get you the relief you deserve. As a lawyer, he is in a much stronger position to negotiate with your creditors as well as explain all of your options and make certain you are aware of the advantages and disadvantages of both, as well as potential tax consequences. Shorter Duration: Whereas most debt relief programs can last up to five years, our goal at Trident is to get you out of debt within twenty-four months. This way, you not only save on interest, you will be more motivated to complete the program – because it you will get through it that much sooner. BBB Accreditation: This is your assurance that you will get the best possible service at a fair price. Trident is one of only a very small number of debt relief companies to earn BBB accreditation. Furthermore, Trident has an “A+” rating. If you are carrying the $30,000 minimum debt required, call Trident today at 303-872-8492 and find out how you can manage your debt and be out from under your unsecured debt sooner than you thought possible – and without bankruptcy.